Alright, enough of this floating around… let’s get started! *For other hook alternative, see below. 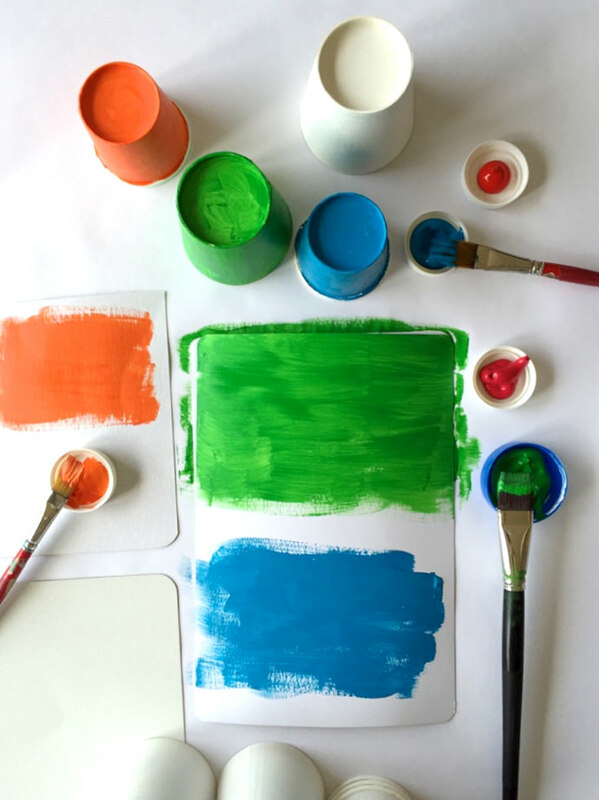 For fish: Paint the medium-sized cups, plus a piece of cardboard (both sides) completely blue and green. I used acrylic paint without water. Let dry. 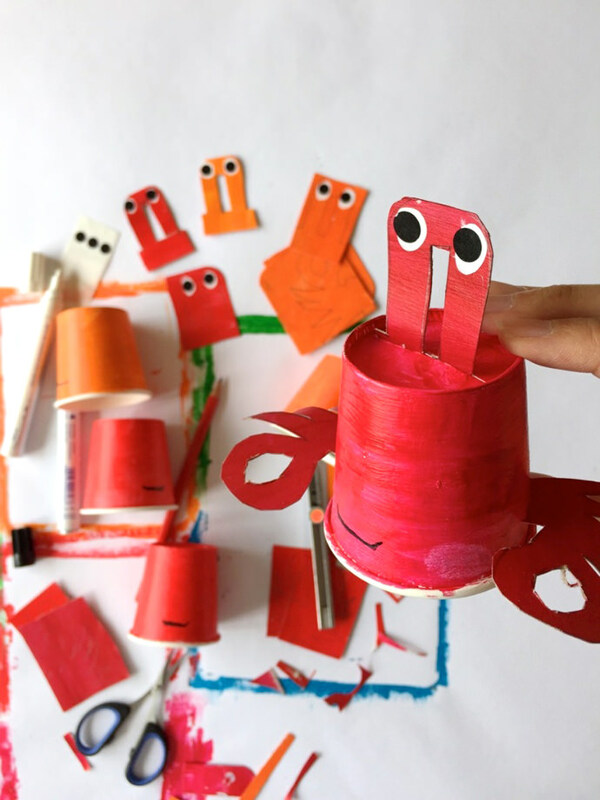 For crabs: Paint the small cups, plus several pieces of cardboard (both sides) completely orange, red or magenta. Let dry. While waiting for the paint to dry, use your pliers to bend your aluminium wire like shown above. 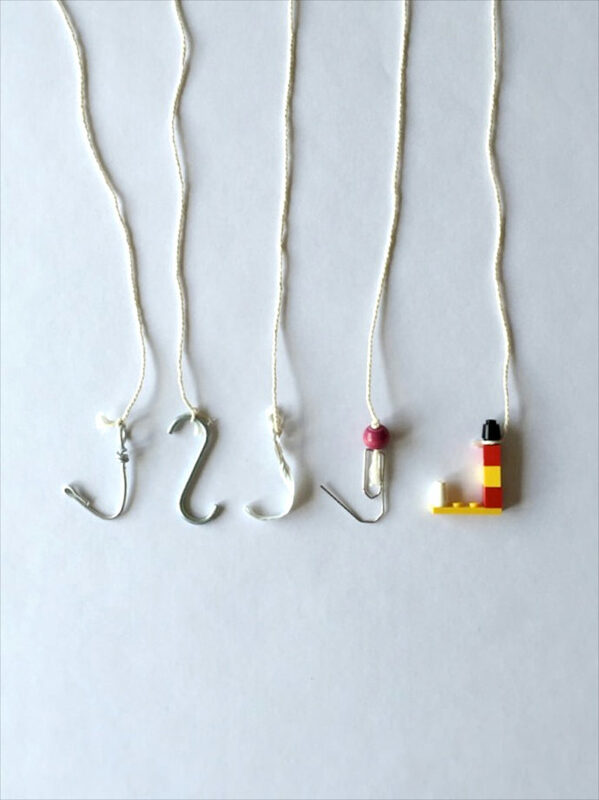 These will be your fish hooks. 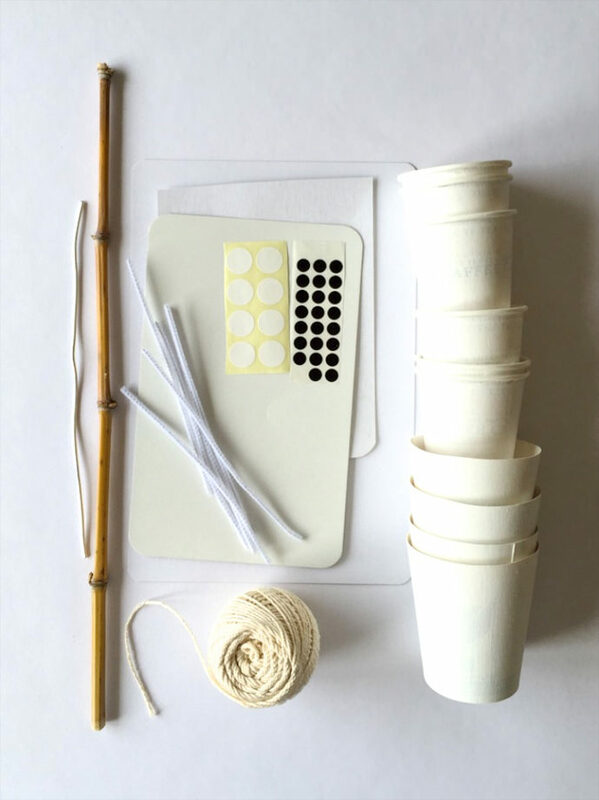 Cut an arms length of twine and tie one end to the hook and one to the bamboo stick. Secure with knots. Use your marker to draw a big smile on the cups! Make sure the mouth is wide enough to have room to cut out the center, as shown above. Cut out the mouth with scissors. Now stick on the black and white circle stickers as eyes. Grab your craft knife. 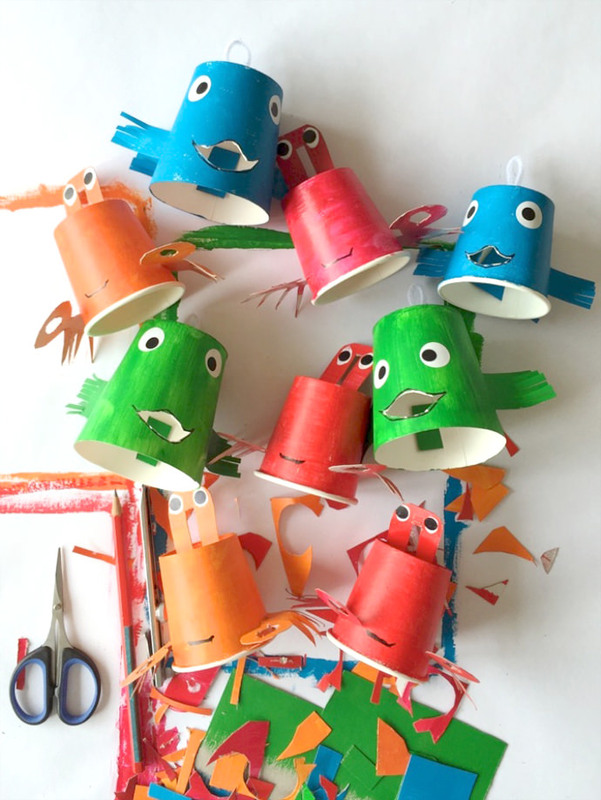 Using the knife, make a cross on the top of your fish’s head (or the bottom of the cup) to stick the pipe cleaner loop into. Now make 2 vertical cuts on either side of the cup and one on the back for the fins. Cut three 3/4 x 2-inch pieces from your painted cardboard. These will be your fins. Insert them into the slits that you’ve made on the sides of your paper cups. Cut small slits on the edges of the fins for a fringed effect. 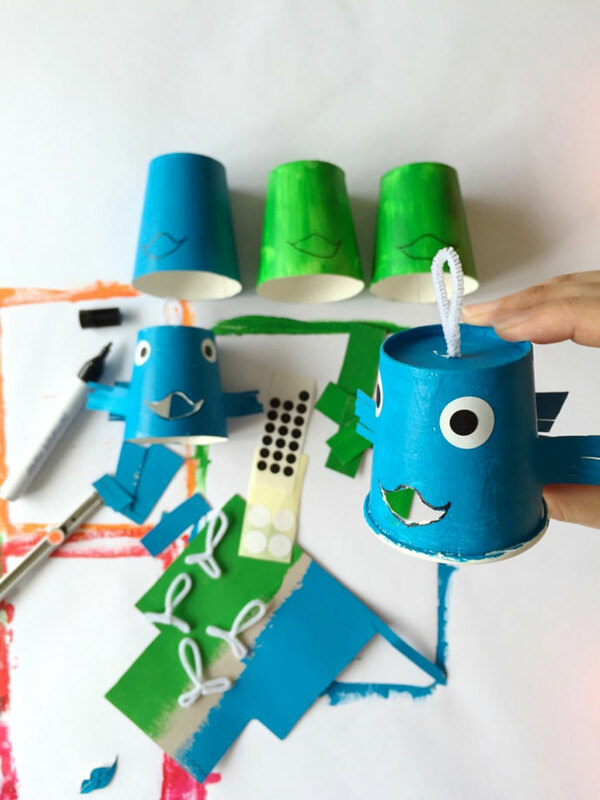 Form loops with your pipe cleaner pieces. Stick the two ends through to the inside of the cup, via the slit at the top. 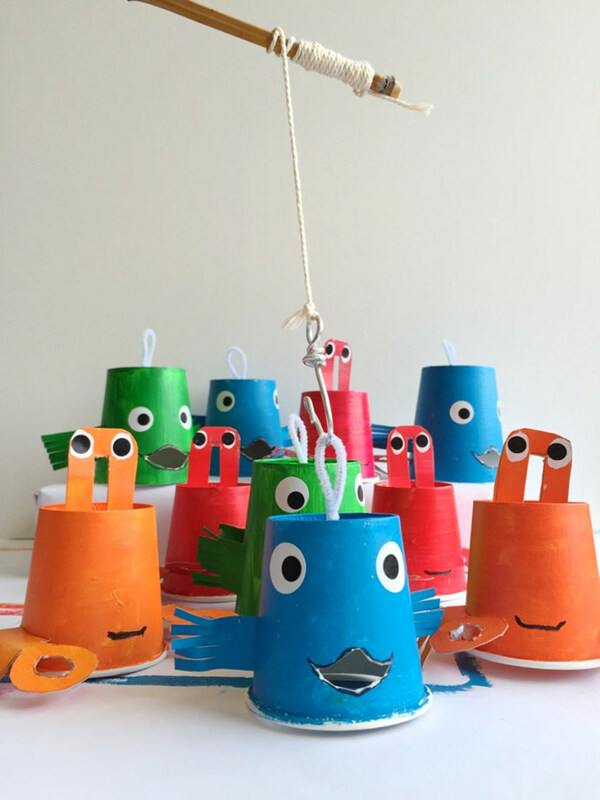 Flip the cup over, and twist the pipe cleaner into a knot, so that it is secure inside the cup and won’t come out when you’re fishing. Your fishies are now ready! Using your black marker, draw a thin smile onto your crab’s face. This doesn’t have to be open like the fish’s mouth. Cut a slit down the middle of the top of your crab’s head. This will be for the eyes. Now cut 2 horizontal slits on either side of the cup, 1/2-inch from the bottom rim. These will be for the claws and feet. Cut two 2.5 x 2 inch pieces of cardboard to make the feet/claws. Draw a closed loop (this will be the claw) and 4 feet on both pieces. These should be mirror images of each other, as shown above. Cut them out. 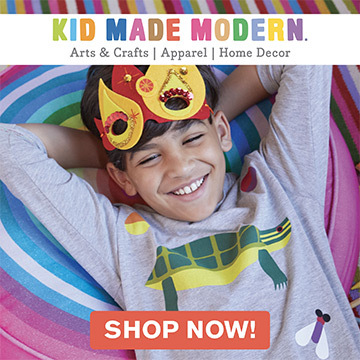 Insert the facing sides into the slits you made with your scissors on either side of your cup. 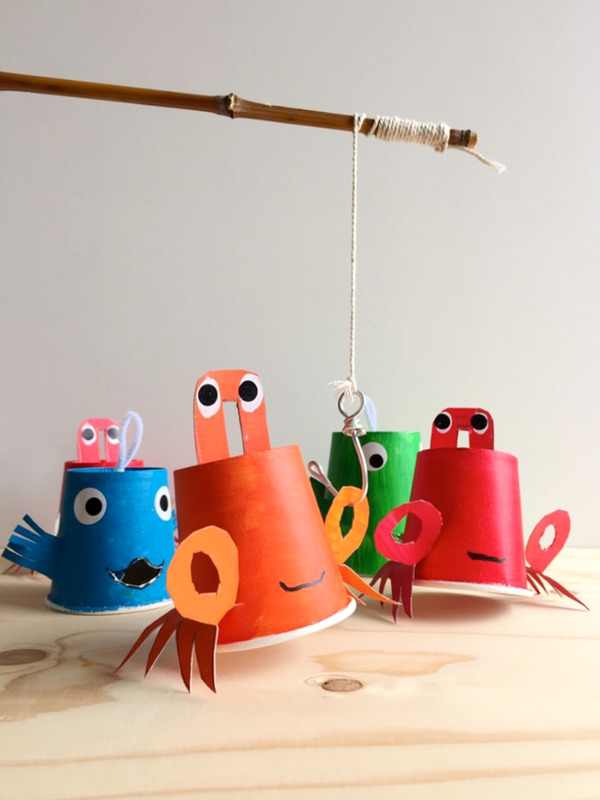 Flip the cup over and fold the latches upward and downward so that the claws are securely attached to the cup. 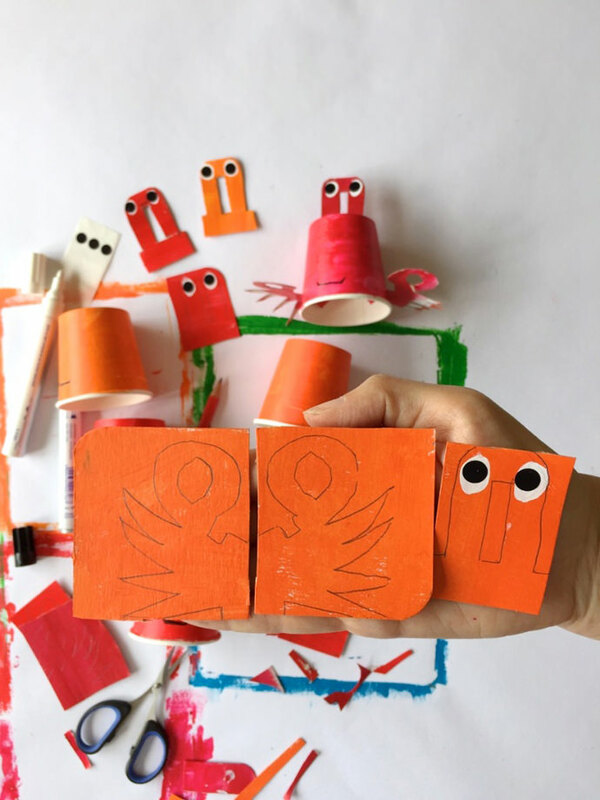 Now cut one 1/2 x 2-inch cardboard piece for each of your crabs and use your pencil to draw the design shown above (far right). Cut out, making sure to hollow out a long rectangle in the center. This will be used for fishing! 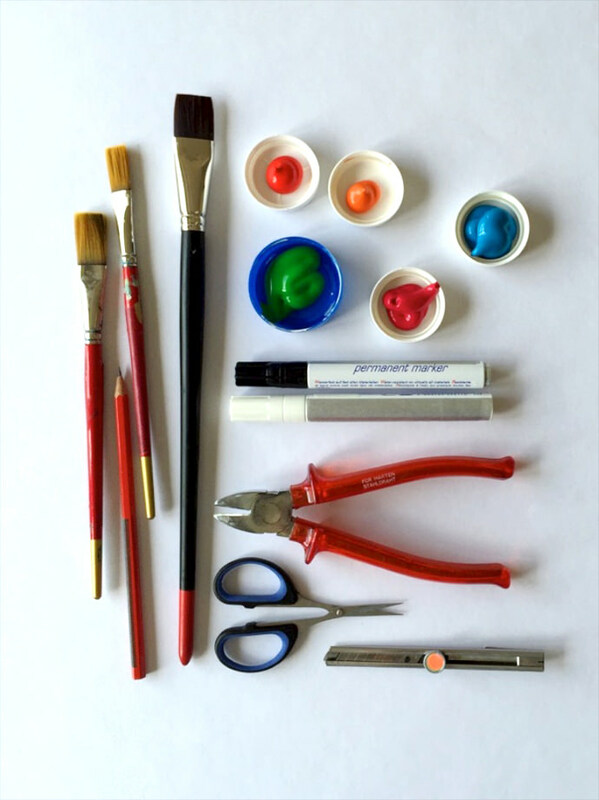 Use your white paint or paint pen to create the eyes, adding 2 black stickers as the pupils. Your crabs are complete! 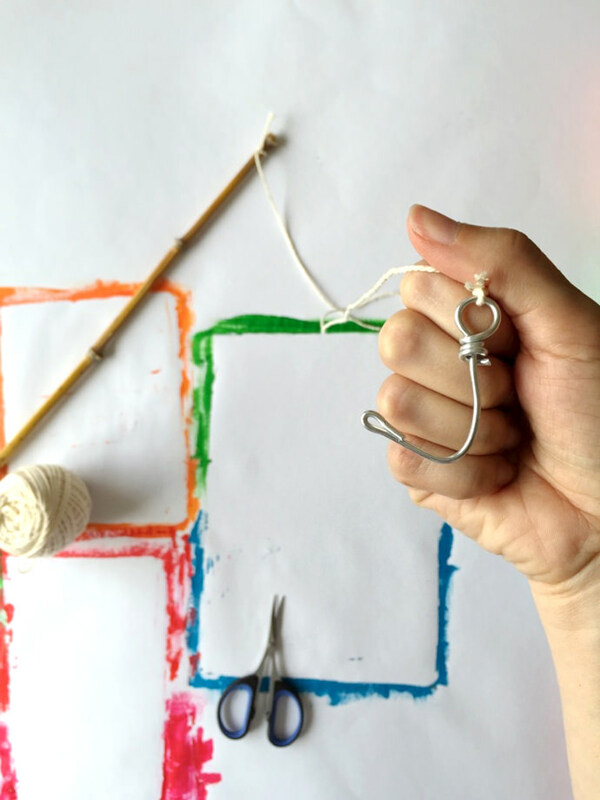 We went on a bit of a hook hunt and found other items that will work just fine! From the left: bend wire (like we did), an S-hook, a plastic bread tie, a paper clip with wooden bead(to act as a weight), and possible my favorite… Lego pieces! For fish: Aim for hooking the top loop (easy) or the mouth (challenge). For crabs: Aim for hooking the claws (easy) or between the eyes (challenge). Note: if the hook spins, open it up a bit or add a weight (like wooden bead) until it holds still. Now grab your pole and let’s go fishing!